Global Travel Media » Blog Archive » THAI Invites Travellers to Plan a Winter Escape to Thailand, Asia or Europe With Deals Starting from $716* Return! THAI Invites Travellers to Plan a Winter Escape to Thailand, Asia or Europe With Deals Starting from $716* Return! 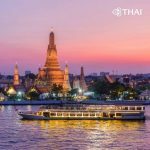 Thai Airways International has released a Winter Sale promotion to popular destinations across the network including Thailand, Asia, India and Europe. Fares to Thailand start from $716* return or to Europe from $1,109* return. Book by 4 Jul 17, travel by 20 Apr ’18 (some exclusions apply). Travel in Royal Silk/Royal First Class available now until 20 Apr ’18, subject to availabiltiy of seats. Fares start from $716* for travel from Melbourne to Thailand, or Europe from $1,109* return. Deals are also available for travel in Economy Class from Perth, Brisbane or Sydney and in Royal Silk Business Class. Royal First Class special fares are available for travel from Sydney to Bangkok return. Destinations from Australia to: Thailand, Vietnam, Laos, Myanmar, Cambodia, Singapore, Malaysia, Philippines, Indonesia, China, Japan, Korea, India, Nepal, Pakistan, Bangladesh, UAE, Oman, Iran and Europe. Visit thaiairways.com for full details or ask any travel agent.